→Hurricane Mop Review : Does This Mopping System Really Work? Cleaning is the most important and also time taking work. So, to make your cleaning easy here we are with a new product Hurricane Mop. Hurricane In and Out Mop is a mopping system that comes with a dual chamber washing and drying bucket. The manufacturer of Hurricane Spin Mop stated that it can efficiently clean, dry, and polish your floors. Also, you need not get down on your hands and knees. They also claimed that the system is environmentally friendly. But how Hurricane work when you get it home? We will discuss everything in this Hurricane Mop Review 2019 post. And even you can also check Hurricane Mop Review On Amazon. 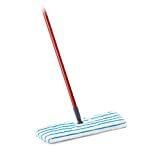 The manufacturer of the Hurricane Mop claims that it is efficient in picking up dirt, hair, and dust so that you do not have to sweep up the floor before mopping. This would save your one step and helps you to finish your work more quickly. They also claim that the material this mop uses can able to hold up to ten times its own weight, so you won’t have to keep squeeze it out again and again. When it soaks up too much water, do not worry it’s really very easy to dry it out, and that’s where the “spin” comes in. 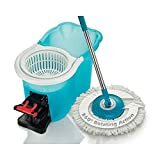 All you have to do is just put the mop in its bucket, and press down the foot pedal and it starts to rotates so that the mop head squeeze out all of the water it soaks. Here, I m going to tell more about Hurricane Mop. The unit consists of a flat mop and dual-chamber (washing & drying) bucket which helps you to efficiently clean and dry the mop by simply putting it into the bucket. The mop is not so extraordinary, but the bucket is incredible. Its feature to clean and dry the mop in separate chambers is really useful. The single biggest caution with this type of mop is the durability of its pad. The device comes with two pads (microfiber pad and scrubber pad), which may enhance the life of this unit. They also said that the pads are recommended as washable and reusable, that should be done with a small amount of salt. The product’s handle is not so strong that what a found a negative thing for this Hurricane Mop system. But what I like most is its “self-wringing” feature. This is a great way to squeeze out the pad than twisting or dunking in a bucket full of dirty water. However, the wringer may actually help make the pads long lasting. We are giving the 4.3-star rating to the Hurricane Spin Mop which is based on its innovative design, and the fact that it’s performing well in cleaning and drying the floor also policing too. Also, it mop head is washable and reusable, so you do not need to buy a new mop head when it gets dirty continuously. 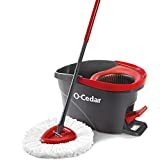 After reading our Hurricane Mop review 2019 what do you think about this product? whether it is important for you or not. Do share your reviews in our comment section. Also, want to know more about it then read customers reviews of Hurricane Mop on Amazon.